Looking for a stunning round of golf? 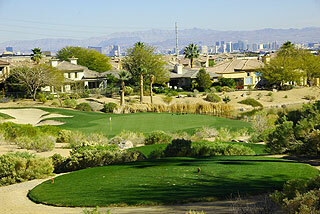 Check out one of the best layouts in Vegas! 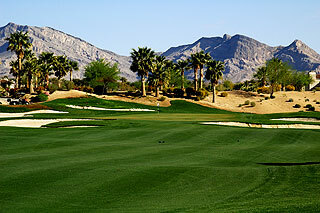 The Arroyo is one of the area's most stunning designs (opened for play in October 2003) and is a public facility that is the sister course to the private Red Rock Country Club Mountain Course. 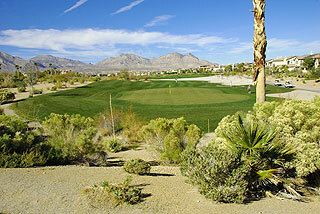 Arroyo is also affiliated with the popular Siena Golf Club in Las Vegas. This Arnold Palmer Signature design features bold, dramatic bunkering and frequent water hazards that provide a stark contrast to the red rock and stunning desert mountain scenery. 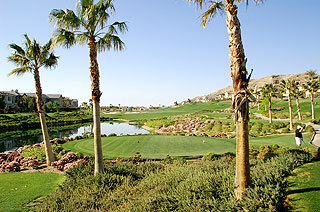 The layout is comprised of six new holes plus 12 holes of the original 27-hole Mountain Course at the Red Rock Country Club - and features private country club conditioning throughout. Parts of the course meander along an upscale residential community - with picturesque homes which actually add to the beauty of the landscape. The clubhouse features a pro shop, restaurant and bar, plus an outdoor patio with outstanding views of Red Rock canyon and the city below. A full breakfast menu and lunch items are available. The banquet and outing facilities are very upscale, and the practice facilities include a double ended grass range (one end used by the Arroyo and the other for the private Mountain Course) and short game area with chipping and putting greens, plus sand bunker. Wide fairways often greet you off the tee, providing ample landing areas from the 5 sets of tee boxes which measure from 4084 (112 slope) to 6883 yards (124 slope). The tee areas are wonderfully landscaped. As the slope rating indicates, the Arroyo is extremely playable- due mainly to the abundant landing and bail out areas greenside. 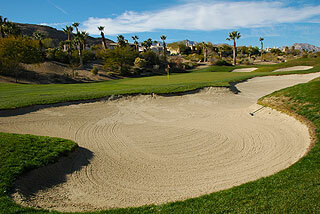 A key to scoring well is to avoid the extremely large and intricately sculpted sand bunkers - 68 in number. Alternate sets provide tee areas measuring 6433/121 slope, 5904/112 slope and 5349 yards with a 117 slope. The average golfer will find the blacks (6433) and blue tees both playable - and may want to take the wind factor into consideration before deciding. The on course amenities include a GPS on all carts that provides accurate information to the front, middle and back of the green- with pin placement sheets also on each cart. Sprinkler heads are also measured to the front, middle and center of the green, adding convenience for shots played away from the cart. The opening hole demands a short desert carry to a wide fairway, leading to a well bunkered perched green that drops off immediately behind into collection areas. Number two plays from a beautifully landscaped tee area with water short left, to a rolling fairway that makes this a tough par four. My guess is that 50% of the people playing the third hole will land in one of the greenside bunkers that surround the putting surface. The fourth hole is quite open - but once again plays to an extremely well bunkered green complex. The fifth is a simple par five and the sixth a straight away four par - both with lots of room from tee to green. Number 7 begins from an elevated tee with a pond along the right side - a beautiful golf hole. The undulating fairway on the par four 8th narrows between two fairway bunkers, with severe mounding and undulations from 150 yards in. The view from the back of this green is drop dead gorgeous - absolutely intense. The same scenery is present from the 9th tee box, as these fairways play parallel in opposing directions. The back side is a bit shorter than the front, with the longest par four at 416 yards. Number ten plays from another set of immaculately landscaped tee areas, to a wide fairway. 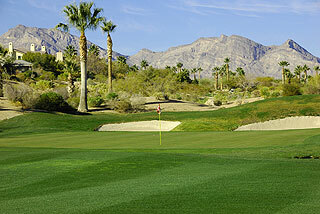 Do not be long on the approach here, as the green complex slopes immediately downward past the putting surface. Avoid the fairway bunkers on eleven, and some low numbers can be had on this # 4 handicap. The green is very deep, so pay attention to the day's pin placement. Twelve presents lots of room - and plays to another postcard mountain backdrop. TIP - look for directions from the GPS on how to get to the next hole (do not cross the street - make a right at the sidewalk and head towards the mirror). 13 is a grip it and rip it hole - avoid the bunkers here and score! Huge bunkers guard the green on the par three 14th. It is open to the left side, but the pin placement on this two-tiered putting surface will determine your shot placement off the tee. Again - great greenside landscaping. 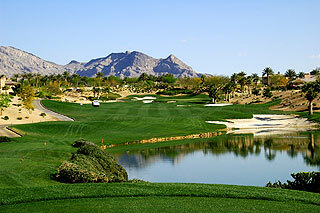 Number 15 is a short and score-able par four with a wide fairway and a lone bunker guarding the front of the green. Sixteen also provides a generous fairway but undulations and mounding will determine your lie. Slightly mis-hit tee shots may be funneled towards the center. The well bunkered green complex here is a beauty. The left fairway bunker is definitely in play on the dogleg left par four 17th. Try to play the uphill approach from the right side. Hold your jaw in place for number 18, as the 401 yard par four closing hole is a beauty. There is a pond short right fronted by a zero entry bunker, but the difficulty is in keeping your eyes off the spectacular mountain scenery. Land it on the left to right sloped fairway and a good finish is possible. 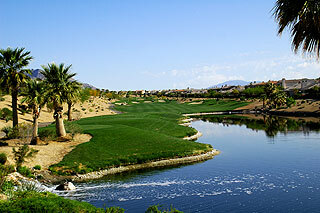 The Arroyo is a spectacular layout with photogenic opportunities that rival those of nearly any course in the valley. 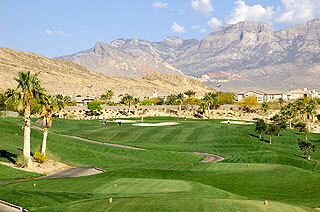 Great practice facilities and conditioning suitable for a private club experience make this a must play while in Vegas. All levels of golfers will be able to choose a tee that suites their skills - and will find the course to be fair but challenging with a great variety of shot opportunities. 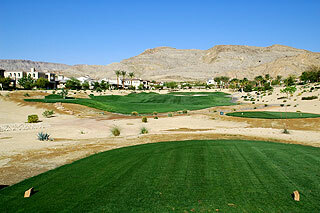 Green fees include cart and range balls, and are very reasonable for the area. HIGHLY RECOMMENDED! For more info, visit our informational page for the Arroyo with a link to their web site by clicking here.